WASHINGTON — The Planck space mission has released the most accurate and detailed map ever made of the oldest light in the universe, revealing new information about its age, contents and origins. The map results suggest the universe is expanding more slowly than scientists thought, and is 13.8 billion years old, 100 million years older than previous estimates. The data also show there is less dark energy and more matter, both normal and dark matter, in the universe than previously known. Dark matter is an invisible substance that only can be seen through the effects of its gravity, while dark energy is pushing our universe apart. The nature of both remains mysterious. The map, based on the mission’s first 15.5 months of all-sky observations, reveals tiny temperature fluctuations in the cosmic microwave background, ancient light that has traveled for billions of years from the very early universe to reach us. The patterns of light represent the seeds of galaxies and clusters of galaxies we see around us today. The findings also test theories describing inflation, a dramatic expansion of the universe that occurred immediately after its birth. In far less time than it takes to blink an eye, the universe blew up by 100 trillion trillion times in size. The new map, by showing that matter seems to be distributed randomly, suggests that random processes were at play in the very early universe on minute “quantum” scales. This allows scientists to rule out many complex inflation theories in favor of simple ones. The newly-estimated expansion rate of the universe, known as Hubble’s constant, is 67.15 plus or minus 1.2 kilometers/second/megaparsec. A megaparsec is roughly 3 million light-years. This is less than prior estimates derived from space telescopes, such as NASA’s Spitzer and Hubble, using a different technique. The new estimate of dark matter content in the universe is 26.8 percent, up from 24 percent, while dark energy falls to 68.3 percent, down from 71.4 percent. Normal matter now is 4.9 percent, up from 4.6 percent. Planck launched in 2009 and has been scanning the skies ever since, mapping the cosmic microwave background, the afterglow of the theorized big bang that created our universe. 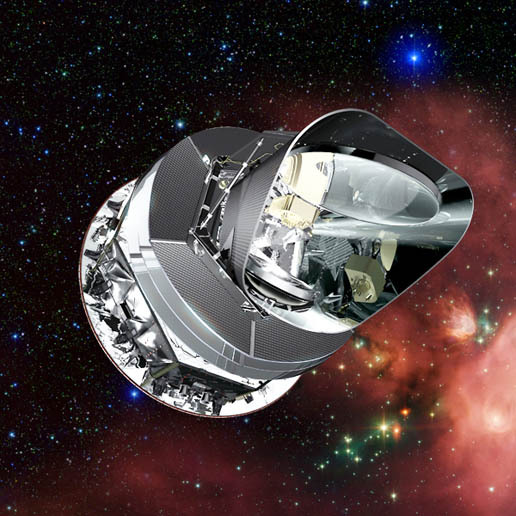 Complete results from Planck, which still is scanning the skies, will be released in 2014. This entry was posted in Uncategorized and tagged astronomy, cosmology, ESA, Hubble, JPL, NASA, Planck. Bookmark the permalink.